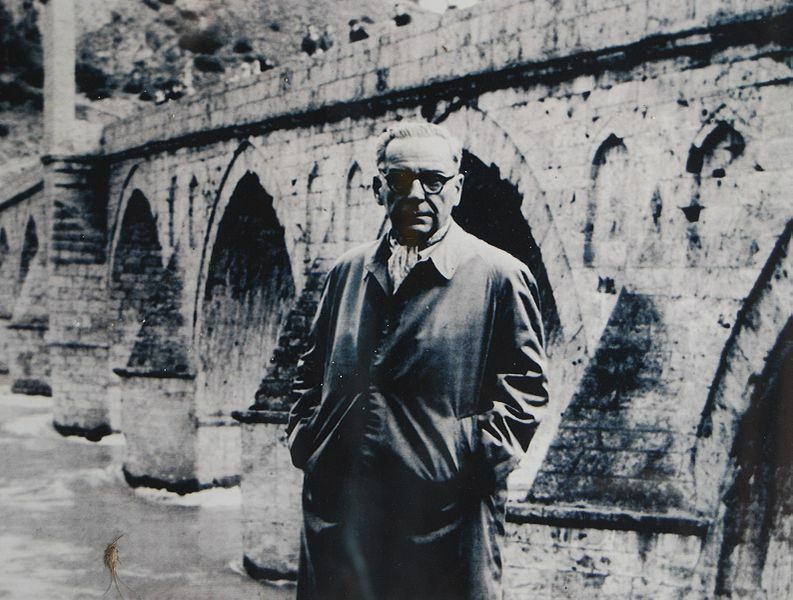 The following is from the opening of Andric’s novel The Bridge on the Drina, published in 1945: Here, where the Drina flows with the whole force of its green and foaming waters from the apparently closed mass of the dark steep mountains, stands a great clean-cut stone bridge with eleven wide sweeping arches. From this bridge spreads fanlike the whole rolling valley with the little oriental town of Visegard and all its surroundings, with hamlets nestling in the folds of the hills, covered with meadows, pastures and plum-orchards, and criss-crossed with walls and fences and dotted with shaws and occasional clumps of evergreens. Looked at from a distance through the broad arches of the white bridge it seems as if one can see not only the green Drina, but all that fertile and cultivated countryside and the southern sky above. On the right bank of the river, starting from the bridge itself, lay the centre of the town, with the market-place, partly on the level and partly on the hillside. On the other side of the bridge, along the left bank, stretched the Maluhino Polje, with a few scattered houses along the road which led to Sarajevo. Thus the bridge, uniting the two parts of the Sarajevo road, linked the town with its surrounding villages. Actually, to say ‘linked’ was just as true as to say that the sun rises in the morning so that men may see around them and finish their daily tasks, and sets in the evening that they may be able to sleep and rest from the labours of the day. 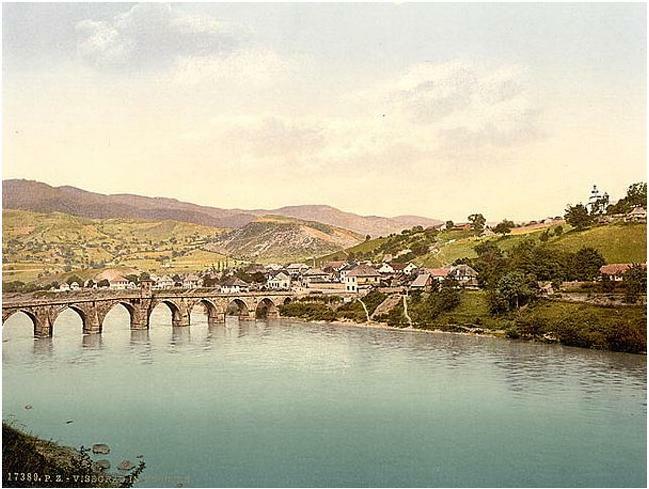 For this great stone bridge, a rare structure of unique beauty, such as many richer and busier towns to not possess (‘There are only two others such as this in the whole Empire,’ they used to say in olden times) was the one real and permanent crossing in the whole middle and upper course of the Drina and an indispensable link on the road between Bosnia and Serbia and further, beyond Serbia, with other parts of the Turkish Empire, all the way to Stambul. The town and its outskirts were only the settlements which always and inevitably grow up around an important centre of communications and on either side of great and important bridges.